Come celebrate National Taco Mac day at our Prado location! 40th party Gather your beer drinking buddies, call your favorite wing fanatic, and get ready for some real partying because we’re turning 40 and we’re ready to celebrate for real! Come celebrate Taco Mac Monday, April 15th at the Prado with an all you can eat buffet full of your favorites, music and entertainment, and chances to win great prizes all night long. There will also be a cash bar available featuring some of our new cocktails and beers. We’re donating all ticket proceeds to our friends at Camp Twin Lakes so your good time goes toward a great cause. “Don’t Call It T.Mac” was made just for us by our buddies at Monday Night Brewing for Pint Night. They kindly used our favorite hop profile, citra and mosaic, a little wheat, and Pilsner and Munich malts for a soft body, crisp bite, and unfiltered goodness. Get yours only at Taco Mac. We celebrated our 40th anniversary with our guests by giving them the opportunity to share their favorite Taco Mac memories and win some free stuff. These are some of our favorite memories! The first year Taco Mac opened, we only sold enough wings to stand as tall as a decent sized sky scraper. Today, we sell enough to reach the International Space Station. 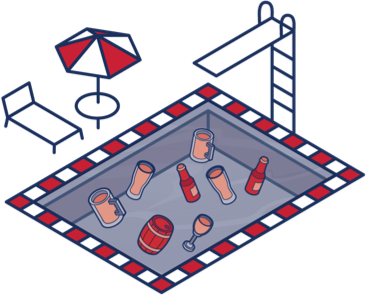 We sell enough beer every year to fill more than an olympic sized swimming pool. We’re working hard to make that a real thing. We’ve featured more than 65,000 hours worth of sports on our screens in the past 40 years. That’s enough hours to get both a bachelors and masters degree and still have time for your bowling league.